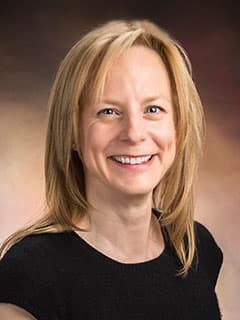 Katherine Dahlsgaard, PhD, ABPP, is Clinical Director of the Anxiety Behaviors Clinic in the Department of Child and Adolescent Psychiatry and Behavioral Science Children's Hospital of Philadelphia. Dr. Dahlsgaard is Clinical Director of the Anxiety Behaviors Clinic. She is board certified by the American Board of Professional Psychology with a specialization in behavioral and cognitive psychology. She specializes in the evaluation and treatment of children, adolescents and young adults with anxiety disorders, particularly selective mutism, social anxiety disorder, obsessive-compulsive disorder, phobias, panic disorders, and generalized fears. Dr. Dahlsgaard also frequently treats children with disorders that commonly present alongside anxiety, such as food selectivity and sleep problems. Dr. Dahlsgaard teaches courses in cognitive-behavioral therapy (CBT) to interns and fellows at CHOP and supervises their CBT cases. Dr. Dahlsgaard is a frequent lecturer and guest speaker and has published widely in scientific journals, books and mainstream media on the topics of child development, psychopathology, mental health and human virtue.